The following replies were submitted on my Model Railroader forum post Layout Plan Revision & Solved a Problem too!Â on Tuesday, October 16, 2007 at 9:01 AM.SpaceMouse wrote:Hey Ryan, That's a lot of track there. Can you explain your operational scheme? pcarrell wrote: Over the stairway? I assume you'll have some like plexiglass sides to keep trains from falling into the GRAND CANYON! Also, are you going to be able to reach those rails to clean and fix derails? Other then that, nice plan! Greg H. wrote: what program did you use? Note: Click thumbnail images for a larger view.Yes Chip, from the Piedmont Division (PD) track plan itself there appears to be a whole lot of track, as a matter of fact the lower level track plan has about 290' of HO scale code 83 flex track and switches. 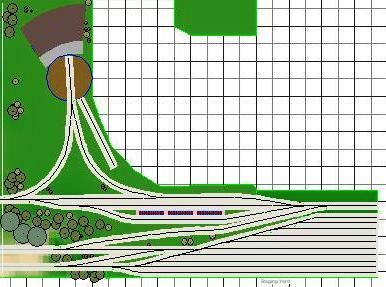 And I hope to answer all your questions below:However, what the track plan does not show very well is that some of the track is hidden and there are 6 main areas that encompass 13 separate Layout Design Elements (LDE's) incorporated within this level. The train room overall dimensions approximate 19'X14'. I will separate out the individual LDE's and explain each of them for clarification purposes. And will start the descriptive analysis from the most natural point of view, and that is from the main entrance to the layout facing the staging yard area. Descriptions will continue on around the layout from left to right and will progress until ending with the around the walls double main line track that makes an ascent to the upper level deck. The descriptions of operations my be a little spotty in some places because the upper level plans are being re-drawn at this time, and some industries will get moved around a bit, but for the most part the basic types of industries have been selected, i.e. steel, lumber, wood pulp, grain, flour, coal, propane, LPG, fuel oil, ballast. Area #1 ~ (4 LDE's) ~ Staging Yard ~ Passenger Terminal ~ Wye ~ Turntable and Roundhouse As for operations in this area there are 4 specific LDE's that define it and make for a lot of activity for 2 to 3 operators. Passenger Terminal includes two tracks for incoming and outgoing passenger service as well as a run around track for turning service cars and locomotives. The terminal can accept a pike-size passenger train with up to six cars and two locos. Incoming passenger trains approach from the east and enter the arrival track and bring the passenger cars up to the covered terminal. Then the baggage and diner cars are uncoupled and brought to the run around siding track as the locos make their turn through the wye. While the passenger cars are being serviced and in this move the locos are serviced as well and turned around for the outbound passenger run. Wye leading from the incoming and service tracks and into the turntable. Turning both passenger and freight locos and leads into the turntable / roundhouse. Roundhouse and Turntable include 6 tracks and 4 inspection pits within the RH, a DCC programming track and others. The plan is for these TT and RH tracks to each have a SPST power switch so that they remain off most of the time, no need to have a dozen or so locos sitting around idling....well maybe one or two! This is also the hub of all MOW and locomotive maintenance activities for the PD. Including all refueling, sanding, and minor and major loco repairs for both freight and passenger traffic. Also, a RIP track will be incorporated here as well. This is surely going to be a central point of activity!This area is my current focus on layout work and continues today. Influenced by the prototype roundhouse and turntable located at the North Carolina Transportation Museum in Spencer, NC, this HO LDE will try to capture the essence of the Southern Railway Spencer Locomotive Shops. You can view my current work on this section of the layout at Roundhouse and Turntable Renovation Project. Lumber Supply and Steel Fabrication Industries offer plenty of switching opportunities with inbound lumber loads of various shapes and sizes as well as empties for outbound returns. And the same type of operations for the steel industry as well. Raw steel sheets and forms arrive on flats and are unloaded for fabrication, however, besides mostly empties on the outbound there will be some fabricated steel shipped out on rail as well as the typical flat bed truck loads. Note that LDE Area #1 and LDE Area #2 are separated with a background, it is hard to see on the overall layout plan, but is noticed in the 3D view above. Area #3 ~ (2 LDE's) ~ Classification Yard & East Lead Tracks ~ Propane Industry This area is mostly a transition point where the staging yard/passenger/loco terminal track leads and timber/steel industry siding track leads all converge into the classification yard track leads. Classification Yard & East Lead Tracks allow the lower deck rail traffic and industries to converge and get ordered for continued outbound traffic. Also, passenger consist traffic by-passes the classification yard at the run around track which begins just to the left of the propane industry siding track (more on that later). Propane Industry siding track services regular tank car loads and empties of 65' LPG, and this siding can occupy up to 5 of these 65' tank cars. Making for more switching interest, as tank cars have to be pulled out of the siding and into the classification yard lead. Area #4 ~ (1 LDE) ~ Classification Yard & West Lead Tracks The main classification yard for the lower deck serviced industries allows unit consists of gondolas and top gons with coal and mixed freight consists to be made up of LPG and propane tank cars, boxcars containing various materials, bulk head flat cars with various lumber loads, flat bed cars with various steel products, covered hoppers with grain, as well as fuel oil and ballast for the locomotive and MOW servicing area. This classification yard is based on a prototype Norfolk Southern (NS) yard located near Asheville, NC.Located just below the classification yard is the run around and siding track that also ties into another industry siding on the right hand side (more on that section to follow). This section of the layout could keep a few people busy for some time sorting out cars and consists for making up trains. Area #5 ~ (3 LDE's) ~ Grain/Flour Mill Industry Siding ~ Begin Mainline Ascent ~ Swing Gate Bridge In this area you can view the end of the west lead track of the classification yard as it approaches the main line and loop leading to the double main tracks. The industry siding serves the grain/flour mill and just below that is the remaining main line loop leading to the swing gate bridge. Grain/Flour Mill Industry Siding provides service to the grain elevator and flour mill industries. Covered hoppers of various length with grain are shipped on inbound freights and switching from the classification yard and set-out track to the siding and will be a regular operating feature. Of course empties will get shipped back as well as bulk flour will get shipped out for food processing industries in the upper deck. Mainline Loop starts at this point and will make a small descent on a -3% grade to make the appropriate clearance as it travels under the upper mainline run. Going under the truss bridge of the upper mainline this track disappears under and behind the bridge abutments and dense foliage. Once pass this point the hidden track of the mainline loop starts an ascent on the +3% grade as it travels over the stairway and up to the double mainline run along the south wall of the room.Protection and safety for the rolling stock and locos on the overhanging track as it wends around and over the stairs have not been decided at this point. But some sort of rail or girder system would keep all moving objects from falling. A ladder will be required to build this piece so I am sure that a ladder will be required to access any track or rolling stock for maintenance and repair in this section as well. Swing Gate Bridge while not being a true exact LDE of sorts, it is a focal point in the train room. And it separates the roundhouse/turntable/passenger/staging track area from the rest of the train room as physical movement is concerned. The swing gate crosses the aisle way at a point that was more of a compromise givens than a druthers. Area #6 ~ (1 LDE) ~ Double Mainline Track The double mainline track starts from the west end classification yard lead track and continues on a +3% grade and wraps around the layout room as it rises about 14" to the upper deck level. The double main then enters a tunnel entrance as it approaches the lower sections of the upper deck level, then it reappears from another tunnel entrance on the upper deck (not shown).I hope this helps with clarifying the operations of the lower deck level of the PD! 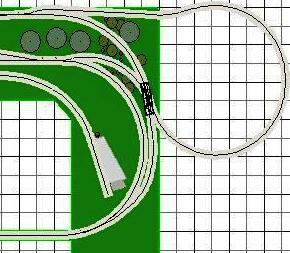 Note: All track plans were drawn using 3rd PlanIT Track Planning Software and currently I am using version 8.01.